Swiss manufacturer Bron has revealed a high-end location lighting generator called the Move 1200 L.
If you were on the lookout for lithium-powered battery packs announced at this year’s Photokina trade fair, you might now find yourself spoilt for choice. As well as Elinchrom, Priolite and Profoto’s offerings, Swiss lighting manufacturer Bron has revealed a high-end location lighting generator called the Move 1200 L.
The ‘Move’ can power two flash heads at once with full asymmetric control of their output. If video is more your thing, plugging in the company’s MobiLED lamps will let you film continuously for up to two hours. The specifications are pretty impressive, as photographers should expect from such a premium brand. Power adjustment is over a nine-stop range (that’s all the way down to 4.5 Joules) with 1/10-stop precision, using the scratch-resistant LCD control panel. Wireless control is possible thanks to a built-in RFS 2 radio receiver. Should you need to freeze movement, the flash duration at minimum power is 1/8,500 second (but full power is much slower, at 1/350 second). 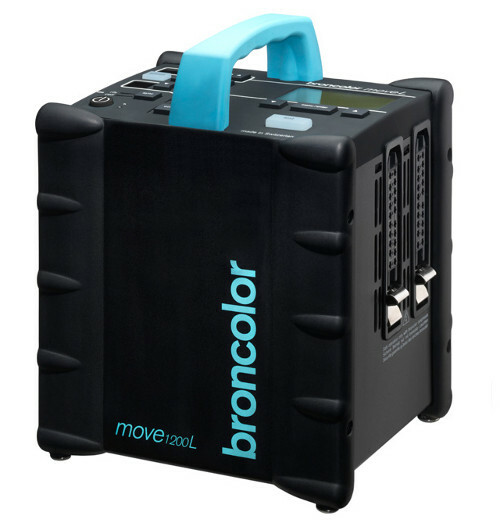 Broncolor’s Enhanced Colour Temperature Control (ECTC) technology is designed to provide “absolute colour stability”. The capacitors will recycle from a 1200-Joule pop in 1.9 seconds (0.9 seconds in “Speed Mode”). For a 1200J pack with an integrated lithium battery, the Move 1200 L is no heavyweight, tipping the scales at 6.2kg. The battery is good for around 170 full power flashes or 230 in “Eco-Mode”. A weatherproof wheeled backpack and a soft case come included, which should make the unit easier to transport and store between photoshoots. Too long; didn’t read? Broncolor representative Urs Recher demonstrates the new Move 1200 L pack in the following video, recorded at Photokina. Pedant’s note: The t0.1 value for flash duration does not mean “all the light” as Herr Recher states, but it does account for most of it, making it more precise than the t0.5 value. What about the price? The company literature says it is “unbeatable” but don’t list a figure, so we’ll have to wait and see. For a list of Broncolor distributors worldwide, visit the manufacturer’s web site.